Whitetail deer hunting tips often result in a hunter earning bragging rights if he shoots a larger buck. Every hunter secretly wishes he or she could display a trophy buck at some time during their hunting career. It's not a matter of wanting to gloat, but just a desire to succeed. Hunting is a complicated sport because so many factors can affect the likelihood of bagging a big whitetail buck that would make any hunter proud. Hunting lands around the country have varying terrains, but whitetail deer habits are quite similar no matter where you live. That means whitetail hunting tips for the northeast can be just as useful for the south. Of course there are also tips that are regionally oriented, so doing specific research on your area is important. To me hunting where I hunt on 300 acres of hardwords forest is a lot different than hunting farm land with crops in the area.The deer may act the same, but the hunting techniques and laws can be quite different. Psssstttt . . . Did You Know . . .
Often the bigger bucks are found in brush that runs alongside the obvious deer trail, and not on the trail itself. A lot of the time they will run across the main trails in the fall looking for a hot doe. Hunters love to share their tips with other hunters. Usually sports people like to keep some secrets, but hunters know that finding the trophy bucks requires a combination of great tips and skill. For example, you know there are certain spots on the deer which make them most vulnerable when shot, such as the lung and heart area, but placing the shot on one of those spots is a whole different matter. That's why there are so many tips related to shot placement available for both gun and bow hunting. 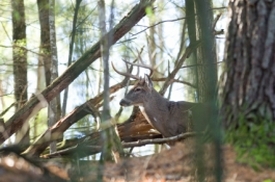 Tips for hunting white-tail deer cover a wide gamut of topics. 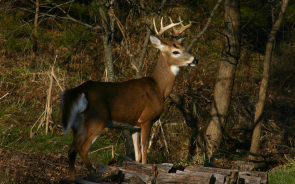 There are tips on attracting and patterning bucks. You can learn how to field dress a deer, recognize obvious and non-obvious deer signs, and where to place your hunting stand. You can read important tips about mapping trophy bucks, scouting for the best hunting areas before the season starts and how to differentiate between a yearling buck and a doe. In fact, you can go back to the basics and get important tips about deer behavior or how to assist with a whitetail deer management program through selective hunting. So go ahead and ask for some whitetail deer hunting tips. But be prepared, because hunters just love to share their not-so-well kept secrets. I happen to chat with a lot of people around the country about hunting whitetail deer in their area. I came across a very well respected and reccomended place with a stunning 18,000 acres with a lot of Whitetails and exotics on the property. I also has some very unique things to do. See for yourself, just follow the link.